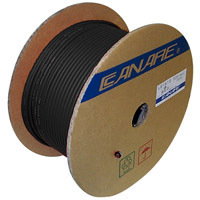 Great Canare 75-ohm Video Coax that offers 8281F type performance for extra long cable runs over wide bandwidth RGB component analog systems. Also recommended for field operations where cable flex strength and maximum durability is a must. Great for longer run Component Analog Video, Video Walls, Video Projectors, Studio Tie Lines and CG Workstations. 75-ohm 8281F Type Coaxial Video Cable -22 AWG. Number of Channels: 5, Red, Green, Blue, White, Yellow. Conductors: 22 AWG Stranded Bare Copper. Conductor DC Resistance: <: 15.5 ohms/1000 ft.
Shield DC Resistance: <: 3.7 ohms/1000 ft.